Ads: we’re surrounded by them. It’s estimated that the average American sees as many as 10,000 brand messages per day. Technology has created a seemingly infinite number of ways to put your marketing message in front of your audience. But with all of that clutter, are you actually reaching anybody? While traditional marketing relies on interruption—stealing the audience’s attention away from something they are actually trying to do—content marketing positions you to be there when your audience is looking for information. Blogs, podcasts, eBooks, webinars, and videos are all forms of content marketing. But the tactics don’t matter nearly as much as the strategic approach. Who (Specifically) is My Audience? 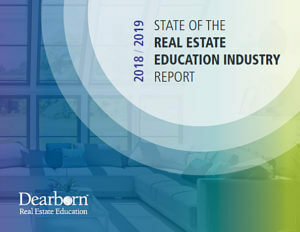 Many real estate schools serve at least two audiences—aspiring real estate agents (with licensing products), and existing real estate professionals (with continuing education and professional development products). Initially, focus on one of these two audiences. Having a generic audience is a good start, but your audience really comes to life with the development of a persona. A persona is a fictional, but accurate, bio of a person within your target audience. Having a specific persona will allow you to write incredibly tailored content, and also have a solid reference point for whether or not a particular topic is a good fit for the audience. Do not skip this step. Lack of focus is one big reason content marketing strategies fail. Lack of focus is a direct symptom of not creating and adhering to personas. This is often referred to as the pain points. The temptation here is to answer this question with a product you sell. And maybe that’s true. But it’s not the answer that will help you develop truly useful content for the audience. There’s a strategy called “the 5 whys” that is credited to Sakichi Toyoda, the founder of Toyota. He is is largely credited with developing the principles of lean that so many companies operate on today. You can also use this strategy to get to your audience’s pain points. Our audience consists of people considering earning their real estate license. Our persona for this audience is Aaron the Agent Wannabe. What are Aaron’s pain points? Aaron needs a real estate course. Aaron wants to earn his real estate license. Aaron has found himself in a dead-end job, and he wants to pursue a career with more earning potential and the opportunity to work independently. Aaron and his wife recently found out they’re expecting a child, and he wants to create a better future for his family. He’s motivated to succeed and wants to get started as soon as possible. I’ve only gone three “whys” deep here, and I’ve barely answered each of them. Yet we’ve already uncovered some tangible and actionable pain points for Aaron. We know he’s a potential career changer, seeking independence and a higher income. We also know his life is about to change, and that is motivating him to get started quickly. How Can I Help My Audience Meet Their Needs? Can I Take a Pennsylvania Real Estate Course while Working Full Time? These are just a few of the endless possibilities, even with the limited amount of information we’ve uncovered about Aaron. You can quickly see how this particular content would be useful to him, and the larger audience of people like him that your real estate school could help. How Can I Create and Amplify My Content? The type of content you produce should be based on two things: what you’re most comfortable with; and what you believe your audience prefers. If you enjoy writing, a blog on your website might be the answer. If you’re a gifted presenter, you might host webinars, record and post videos, or even host live presentations on specific topics at your school. Whatever you choose, dedicate yourself to being successful in one channel before expanding and moving on to other channels. Creating great content is important, but it’s equally important to make sure your audience knows it exists. Social media is a great resource for affordably and effectively getting the word out. In a previous article, we’ve detailed 7 strategies you could employ to effectively use social media to promote your real estate school. Our Marketing Best Practices Guide also explains how you can use tools like search engine optimization (SEO) and email marketing to promote your content. As a final note, if you choose to execute a content marketing strategy to grow your real estate school, you must set goals, make a plan, and hold yourself accountable. This isn’t a one-time thing like running a newspaper ad. This is a long-term commitment you are making to be a trusted resource for your audience. With time and effort, you can build an unshakable position as a real estate education leader in your marketplace.